Transpiration is essentially a function of the amount of leaves present. With no leaves, there is no transpiration and no water use. The extreme case is tree removal. If canopies are pruned there is reduced water use. The more canopy reduction, the more transpiration reduction. Most citrus produces terminal flowers, so there is also a reduction in yield, but there is also typically an increase in fruit size as competitive fruit growing points are removed. There is a balance between yield reduction and tree water use, but typically a 25% canopy reduction results in a 25% decrease in tree water use (Romero, 2006). The severity of the drought will determine how drastic the canopy should be trimmed. The trees can be skeletonized so that only the main structural branches are left. The tree is whitewashed to prevent sunburn and the water is turned off. As the tree gradually leafs out, the water is gradually reapplied in small amounts. It's important to check soil moisture to make sure the tree do not get too much or too little water. The trees if pruned in the winter will often flower a year later in the spring, but normal production will often take three years for the trees to recover their previous yields. Skeletonizing should first be practiced on orchards that are the poorest producing. 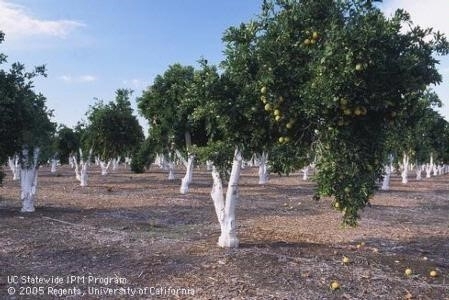 In those areas that get too much wind and have lots of wind scarring or elevated water use, those areas that are most prone to frost damage, those areas that have been always problematic, such as fruit theft. In areas that are healthy and a new variety has been contemplated, this is the time to topwork and replace that old variety. In areas that have been poor producing from disease, this is the time to get rid of those trees. Canopy sprays of kaolinite clay have shown some promise in reducing transpiration with negligible yield reduction (Skewes, 2013; Wright, 2000). If these are used, they should be done under the advisement of the packing house to make sure the clay can be removed in the packing house. With a reduced canopy, there are often other benefits besides water reduction. There is better spray coverage for pest control. There is also reduced fertilizer use. New growth is normally coming from nutrients that are now being mined by a large root system and fertilizer applications can be significantly reduced or eliminated altogether for a year until fruit set recommences. Navel trees skelotinized and topworked, ready for rain and more profits in the future.